Butter is a dairy product made by churning fresh or fermented milk. Salt is added to butter as a preservative, however the amount of salt from different butters vary. They can contain as much as 5%% salt or about 1 teaspoon per stick. Salted butter is used extensively for food preparation. Butter is used for sauteing, frying, making sauces, and most especially in baking. Specially when sauteing or frying take into account its relatively low smoke point (around 350°F = 176°C). Unsalted butter must be handles more carefully as it has no salt to help preserve it. Most baking recipes and higher quality recipe websites use only UNSALTED butter in their recipes. Since butter must have an 80%% minimum milk fat content, unsalted butter may actually have more fat or more water than salted butter and thus can affect crusts, short doughs and other high butter content recipes. 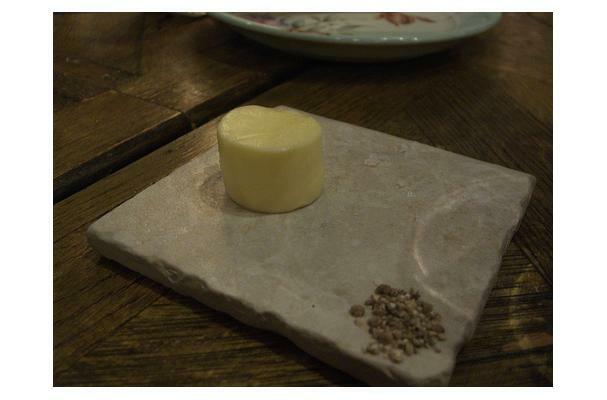 European style butters use cultured milk as a starter and the resulting butter thus have a slightly fermented acid note to them from the production of butyric acid. When highly cultured the butter will begin to have a cheesy note to it. This is also common in Mexico and Latin America. Light in color, from a pale ivory to a slightly darker ivory beginning to appear slight yellow in color. In the eastern part of the US it is often sold either in 1 lb blocks or in 1/4 lb long sticks. In the western part of the US it is often sold in 1/4 pound sticks that are shorter and fatter than the long sticks sold in the east. Food complements: Almost all foods but partuclarly baked goods, Cooked pastas, Acidified sauces such as hollandaise, Bearnaise and red wine reductions to serve with meats. Buying: Salted butter is available at all grocery stores.